IGL Ecoshine Tyre is a water-based, zero-VOC tire dressing that was formulated to both condition and protect tires in one easy step! Using a unique blend of emollients and waxes to deep penetrate your tire’s rubber, IGL Ecoshine Tyre provides a non-greasy, and sling-free finish. Rather than providing an artificial shine, IGL Ecoshine Tyre promotes a natural shine and luster – creating the look and feel of a brand new tire! A basic detailing staple, a tire shine/gel, is also one of the most important. You wouldn’t want to wear a fancy outfit with old and dirty shoes, would you? Having perfectly detailed tires is a must for most detailers, both professionals and enthusiasts, and having the right product is important! IGL Ecoshine Tyre provides a non-greasy, satin finish on your rubber tires that doesn’t leave behind any residue and won’t sling off! Apply IGL Ecocoat Tyre with a microfiber applicator and enjoy freshly detailed, conditioned, and shined tires! IGL Ecoshine Tyre is formulated to bring life back into your dull and faded rubber tires. But instead of creating an artificial shine, IGL Ecoshine Tyre penetrates deep into the rubber surface to provide a genuine glow that lasts! 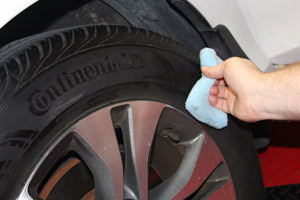 IGL Ecoshine Tyre is non-toxic, biodegradable and has a nice, fresh scent that makes applying a joy instead of a chore. Protect and enrich your tire’s rubber with IGL Ecoshine Tyre! 1. First clean the surface with IGL Ecoclean Wash or IGL Ecoclean Multi. 2. 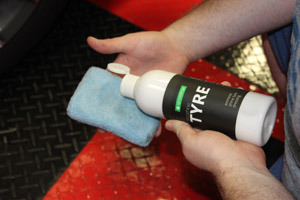 Apply product directly onto a microfiber applicator pad and spread evenly around tires. Allow to dwell on the surface for approximately 10 minutes before driving. 3. Multiple coats can be applied for increased shine. IGL Pro Tip: Do not use IGL Ecoshine Tyre on tire treads or other surfaces where grip is important. 500 ml | 16.9 oz. IGL Ecocoat Wheel Kit 30 ml.